Our Herbal Baby Powder is made from all natural ingredients and feature allantoin from the comfrey plant's roots to help the body heal itself. 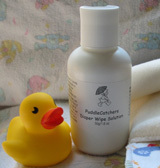 Especially nice when used in combination with the natural diaper wipes and balms at diaper changes. Lightly scented with Lavender, it is sure to please the senses. Please follow the directions on the bottle for proper usage of powders around babies. Base Ingredients: Cornstarch, Arrowroot Powder, Allantoin Powder, Kaolin Clay, Essential Oils. 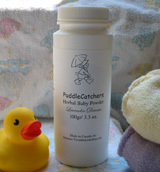 All of our PuddleCatchers body care products are made in Canada by a mom run biz! All PuddleCatchers products are handmade from original recipes. All of the PuddleCatchers products and ingredients are well researched and the recipes are filed with Health Canada in accordance with Health Canada's Cosmetic Notification Program. We strive to offer an alternative product to the commercially produced personal care choices on store shelves that is natural and safe. Base Ingredients: Olive Oil infused with Calendula, Comfrey, Chamomile and Borage, Beeswax, Shea Butter, Rose Hip Seed Oil, Aloe Vera Gel, Avocado Oil, Emu Oil, Lavender Essential Oil, Tea Tree Essential Oil, Allantoin, Cornstarch, Vitamin E, Essential Oils of Myrrh and Immortelle. Base Ingredients: Olive Oil infused with Calendula, Comfrey, Chamomile and Borage, Lanolin, Beeswax, Grapeseed Oil, Shea Butter, Aloe Vera Gel, Sweet Almond Oil, Allantoin, Vitamin E, Essential Oils of Lavender, Tea Tree, Mandarin Red. Base Ingredients: Sweet Almond Oil infused with Calendula, Beeswax, Aloe Vera Gel, Vitamin E. Unscented. These baby soaps are made from the gentlest oils and herbs available featuring calendula oil, sweet almond oil, extra virgin olive oil and safflower oil for a mild, gentle clean. Bars are delicately scented with your choice of either Lavender or Geranium & Lavender. Bar Soaps are 110g/3.8oz in weight. Mini Soaps are 35g/1.2oz in weight.